In our lab, we have devised targeted screens of small molecule kinase inhibitors with well-defined selectivity profiles to identify novel signaling pathways that control ESC identity. 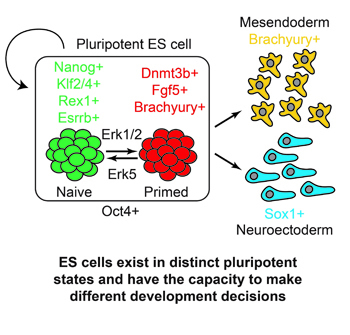 In one such screen for inhibitors that modulate transition between “naïve” and “primed” pluripotent ESC states, we uncovered a critical function for the Erk5 signaling pathway in maintaining naïve pluripotency and suppressing transition to the primed state. We then used kinase inhibitor selectivity engineering and CRISPR/Cas9 genome editing to confirm the role of Erk5 in pluripotency. 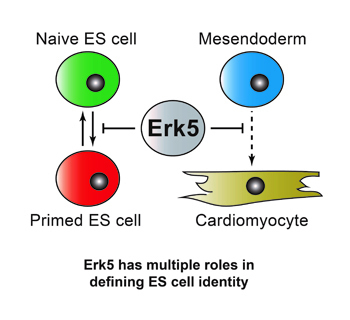 Excitingly, we also find that Erk5 restrains cardiac specific gene expression and differentiation of ESCs to functional cardiomyocytes. One of the main interests of the Findlay lab is to understand the molecular mechanisms by which Erk5 controls ESC pluripotency and differentiation. We are currently using cutting-edge phosphoproteomic technologies to identify Erk5 substrates and downstream targets, and total cell proteomics and RNA-SEQ to explore the wider role of Erk5 in regulating gene and RNA expression. We are also investigating novel approaches to activate and inhibit the Erk5 pathway in ESCs. We believe that this knowledge can be exploited in reprogramming of somatic cells to naïve pluripotency, and to promote differentiation of cardiac tissue from pluripotent cells.